PORTLAND, Ore.--(BUSINESS WIRE)--For nearly 50 years, KinderCare Education® (KCE) has provided high-quality early education and child care to hardworking families throughout the U.S. This approach to early education is paying off. The results from the TerraNova® and BRIGANCE® national studies confirm that KCE students are better prepared for school. Children enrolled in a KCE kindergarten program are, on average, performing at first grade levels, consistently outperforming their peers in math and reading. And whether they are learning to crawl or learning their first words, KinderCare kids continue to achieve key developmental milestones more quickly, the longer they are enrolled in the organization’s early childhood education programs. The impact of quality early childhood education extends beyond childhood. As reported by the Brookings Institute, children with higher levels of school readiness at age five are generally more successful in grade school, are less likely to drop out of high school, and earn more as adults. A separate Brookings Institute report noted that in countries like the United States, getting a good education is one of the most promising routes to economic security. A study using TerraNova Third Edition, a standardized assessment to measure reading and math skills in kindergartners, concluded that KinderCare kids are performing at first grade levels by March of their kindergarten year. “Beyond teaching young children the developmental and social skills they need for general success, the TerraNova results prove that KinderCare Education helps students show up to kindergarten and first grade confident they have the academic skills needed to flourish,” said Wei-Li Chong, President of KinderCare Learning Centers and KinderCare Education at Work. KCE used the BRIGANCE developmental screen to see how children are meeting developmental milestones for physical, language, academic / cognitive, social-emotional development and self-help skills. The BRIGANCE Early Childhood Screens III tool was used to assess children in KinderCare programs nationwide, and results found that KinderCare students see significant improvement in their developmental status after spending more time in KinderCare Centers and programs. Children with more than a year of enrollment in KinderCare programs are less than half as likely to be flagged for potential delays and are more likely to be developmentally advanced for their ages. 61% of U.S. households with children have two working parents, according to the Bureau of Labor Statistics, which means making time to tour an early childhood education center during the center’s weekday business hours can be challenging for many families. To make finding great childcare easier for families, KinderCare is hosting a national Open House on Saturday, July 21, 2018, in select centers across the U.S. Families are invited to drop into their local center, meet the teachers, and learn more about KinderCare’s approach to quality education. Families can learn more about KinderCare’s curriculum, and a list of participating Open House locations around the country by visiting KinderCare’s website at www.kindercare.com. 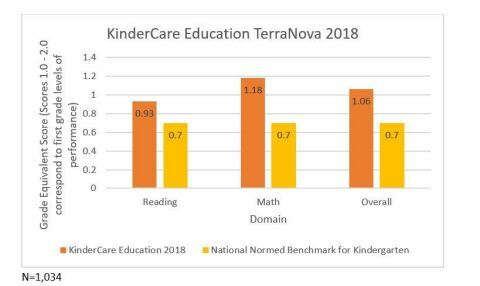 The TerraNova, a standardized year-end assessment, was administered in March 2018 to 1,034 kindergarten students in 126 KinderCare Learning Centers and KinderCare At Work Centers throughout the U.S. The students were five years old at the time of the research. The BRIGANCE Early Childhood Screens III, a standardized developmental screening tool, was used to assess 36,892 children (16,334 of whom were assessed in both the fall and spring seasons) in 407 centers and sites nationwide during the 2017-18 school year. Children ranged in age from 6 weeks to 7 years old. KinderCare Education operates more than 1,300 early learning centers, more than 500 Champions sites, and is supported by a corporate team of nearly 500 headquarters employees based in Portland, Oregon. In 2018, KinderCare Education earned their second Gallup Great Workplace Award – one of only 39 companies worldwide to earn this award. To learn more, visit kc-education.com. 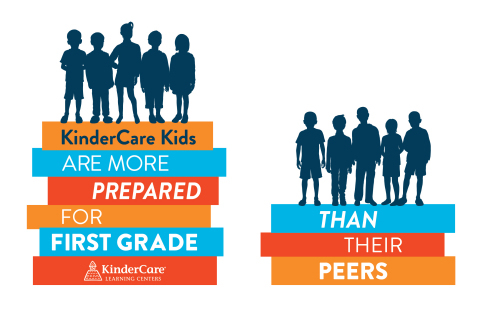 The results from the TerraNova® and BRIGANCE® national studies confirm that KinderCare Education students are better prepared for school.